Many couples prefer to select a ring that expresses their journey through life. A past, present and future engagement ring represents the love they have already demonstrated, their present commitment and the hope that the strong bonds they have formed will continue long into the future. These types of rings have three stones, and each stone marks a point in time.A number of celebrities are choosing this particular style because it’s considered to be trendy. For instance, Christina Ricci and James Heerdegen chose a stunning past, present and future engagement ring, which perfectly suits Christina’s delicate hands. Nicole Kidman and Keith Urban also chose this style of ring. Nicole considers the ring to be a fashion statement; she is often seen just wearing the engagement ring without her wedding band. Where Are the Best Places to Buy Past, Present and Future Engagement Rings? 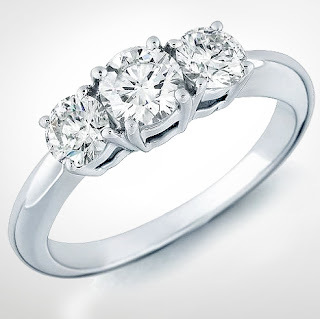 Wholesale diamond sellers offer certified diamonds for low prices, which makes the past, present and future engagement ring affordable for just about anyone. They also carry a myriad of ring settings to satisfy any style or choice of metal. Additionally, a custom past, present and future engagement ring can be made to meet your particular specifications. Custom settings allow for the highest sparkle effect of diamonds because they can be made to fit your diamonds perfectly. Even if the diamonds are not of the highest quality, a custom setting will present a high-quality appearance. Buying certified diamonds from a wholesale diamond seller will allow you to obtain diamonds of a higher quality than you can expect to find at most retail jewelry stores. How Do I Locate a Wholesale Diamond Seller? Finding a wholesale diamond seller won’t take very much of your time. They can be located by performing a simple Google search. Pay particular attention to websites that allow for ratings of these businesses. Websites such as Yelp are extremely helpful when researching ratings because users of this website post their personal experiences with wholesale diamond dealers all across the nation. Finding a dealer in your area on this site is simple. For instance, if you live in Los Angeles, enter the term “Los Angeles diamond seller” into the Yelp search bar. Performing this type of search should display a list of the sellers in your area. How Can I Ensure the Quality of Wholesale Diamonds? Before you purchase an engagement ring, be sure that you get the quality you will be paying for. Ask for a GIA or EGL USA certificate to see the true characteristics of the diamonds. There will be a score for quality, cut and color on these certificates that you can examine before you purchase the diamonds. An engagement ring is something that you will wear for many years to come, so it is important that you look for quality stones and a setting that will stand the test of time.